Goodreads: The summer he’s fifteen, Sam enjoys, for a few secret months, the unexpected attention of Suzie Epstein. For reasons Sam doesn’t entirely understand, he and Suzie keep their budding relationship hidden from their close knit group of friends. But as the summer ends, Sam’s world unexpectedly shatters twice: Suzie’s parents are moving to a new city to save their marriage, and his own mother has suddenly left the house, leaving Sam’s father alone to raise two sons. Kritters Thoughts: Told through multiple points of views and with a story for almost every year, this story shows a group of kids watch their parents fall and apart and then as they mature they deal with almost the same "adult" issues. Sam is the character that takes most of the focus and the reader really gets to know him as he "dates" one friend in their younger years and then another in high school and on and off through college. One of the things that really set this book apart for me was the lapse of time. With each chapter taking a different person's point of view and almost all of them a different year in time (presented chronologically) I felt like I really got invested in these characters and had the hardest time letting go. I loved how conveniently that after they all left the neighborhood for college and jobs and other pursuits there was an event or happening to bring them back into town - I didn't find it out of the ordinary, but it helped bring these characters back together to interact. I loved the title and may be reading a little into it, but I loved seeing a group of kids watch their grown ups and then become grown ups and some repeat mistakes and some make different mistakes. It was so fun to have kids as the central characters, but their parents didn't take a back burner throughout the entire book. 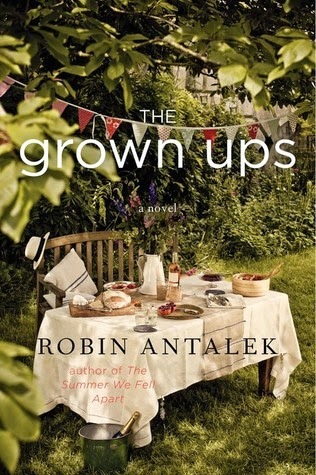 Robin Antalek perfectly balanced each character's part of the book. I will definitely be checking out her backlist - The Summer We Fell Apart soon and will let you know what I think! Ooh I love the idea of the kids watching the grown ups, then growing up themselves. Stories that span generations always appeal to me. I recently finished this, and I agree about the fantastic writing. I have to say that I loathed Suzie and Michael, and I really hoped they would be miserable. Sam, though - I liked Sam, and I liked Bella. This would be a great book for a book club. I enjoyed your review!